Throwback to the Easter holidays (yes, I am lagging! ): my boyfriend went to Japan for a week and I obviously gave him a small shopping list. When I think about beauty shopping in Japan, I immediately think of all the sheet masks that you can find in drugstores. It's sheet mask heaven! As I couldn't do much discovering myself, I went for a few golden oldies that I've purchased there in the past, as they have never failed me. 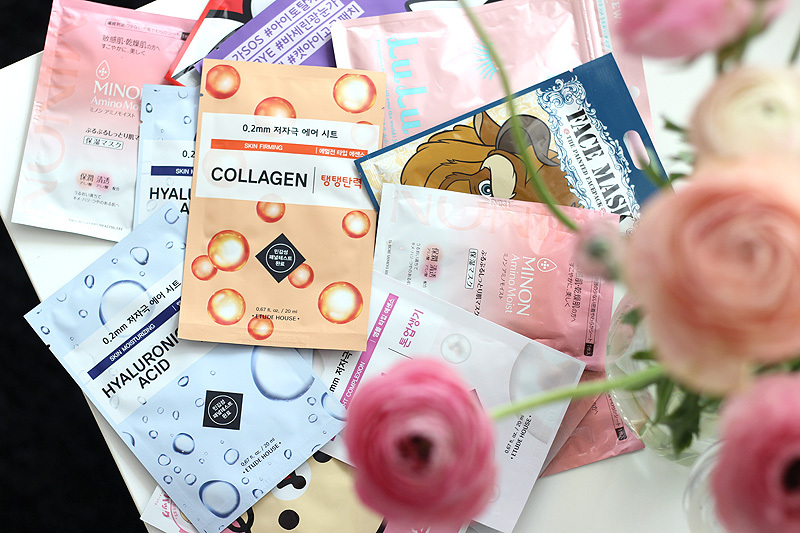 So if you - or one of your loved ones who'd gladly pick up a few bits and bobs for you - are headed to Japan, this haul can double as a pretty straight-forward list of easy to find sheet masks that won't break your bank and will help your skin! 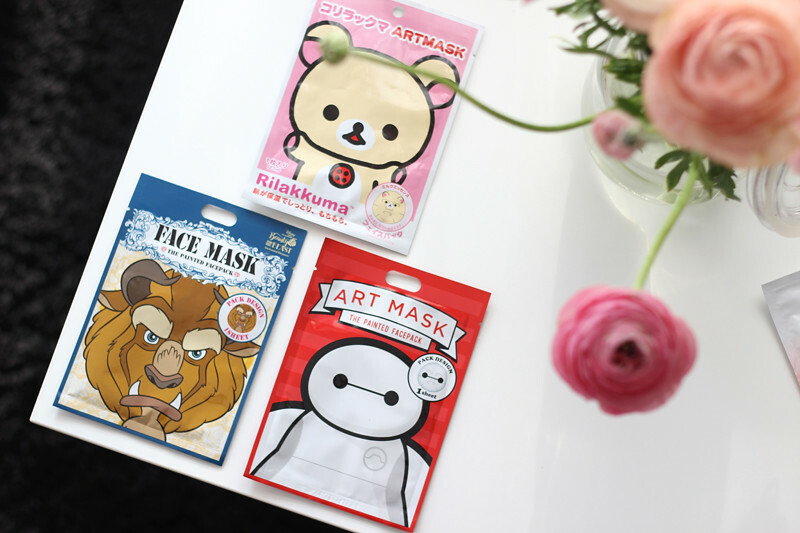 First up are some of the most popular sheet masks you'll find in regular Japanese drugstores. Minon Amino Moist by Daiichi Sankyo is sold in multipacks and is a great moisturising mask. The sheet mask is drenched in a nourishing and calming gel essence formulated with 9 amino acids (in order of concentration: arginine, serine, alanine, glycine, threonine, valine, histidine, proline & leucine) to restore and protect your skin's barrier and restore moisture levels. For more info on amino acids and how they work, check out this website which provides a lot of info about each amino acid. You'll pay about €14,00 for a pack of four sheet masks. 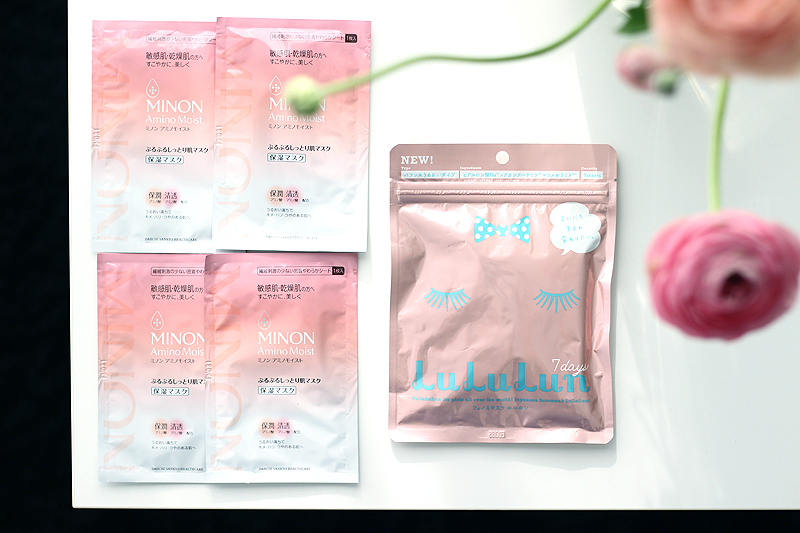 Another great (but more basic) drugstore option are the LuLuLun sheet masks. 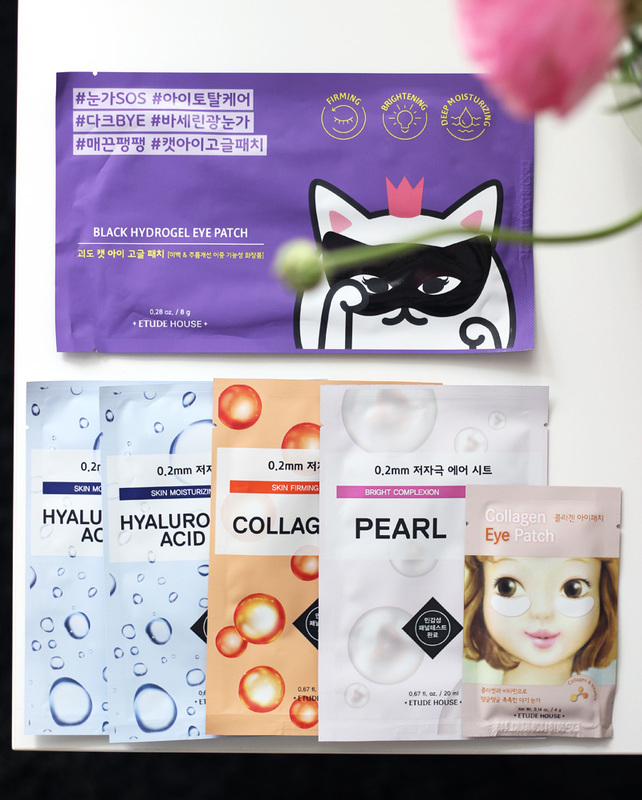 These also come in multipacks, the most popular pack contains 7 sheet masks that all come in the same pouch, meant to be used once daily for a whole week. Luckily though you have 80 days until you have to finish each pack, so if you feel like a sheet mask a day is too much you can use them less frequently too. There are three different varieties, of which I have the pink version which basically promises to restore your skin's moisture balance. The essence in which the sheet masks are drenched is formulated with promising ingredients such as glycerin, niacinamide and hyaluronic acid and is also packed with many extracts like ginseng root extract, aloe vera leaf extract, blueberry leaf extract, avocado fruit extract and mandarin peel extract. You'll pay about €6 for a pack with 7 sheet masks. 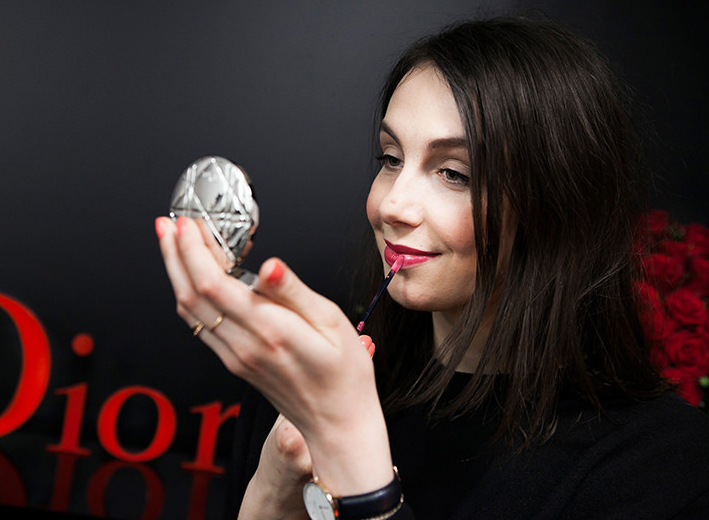 In Japan you'll also find a few flagship stores of popular Korean beauty brands. Korean cosmetics are at least as exciting as Japanese cosmetics, so I would definitely advise a trip to shops of brands like Etude House or Skin Food. I didn't want to ask my boyfriend to tour around the whole of Tokyo to collect all of the sheet masks I'd like to get, so I opted for one store: Etude House. I love this brand! They have a collection of basic masks ("therapy masks" according to their English website) that are super budget friendly and feature a range of popular ingredients such as collagen and hyaluronic acid, but also snail and other fruits. The Collagen Eye Patch is one of my very favourite products from this brand: these work wonders on my under-eye area! I also got the Black Hydrogel Eye Patch because it looks so cute and funny - I haven't tried it yet though. The basic sheet masks cost just over €1 a piece, while the more specialised sheet/gel masks and patches range between €2 and €5 each. Last but not least I have recently discovered the fun of art masks. These can be seriously cute! I asked my boyfriend to send through the ingredient list so I could take a peek at which would be the most suitable for my skin, and I ended up with a cute Rilakkuma mask and two Disney masks which are all moisturising. If you're unsure about the ingredient list when it's only listed in Japanese, I strongly advise to download the Google Translate app which translates from Japanese to English in real time through your camera. Art masks can be a little more expensive as they're branded and usually cost between €2 and €5 each. If you're interested to see what I bought in Japan when I was there myself in 2014, check out my haul post here. If you're not headed to Japan anytime soon but still would like to purchase some of these, check out this more recent post I did in which I also talk about my favourite online shops for Japanese and Korean cosmetics.